In the last few years, Design Systems have become a necessary point of reference for designers and developers as they create digital products. This collection of reusable components, along with branding information and other documentation, is found in one central place. Design Systems focus on more than just visual presentation; they also cover the big picture for the brand. No doubt about it, Design Systems make things much easier and streamlined for teams. Because they have become such a key part of a team’s documentation, it’s only natural that Design Systems are a popular topic and as we scroll through industry news. It’s pretty easy to find helpful information and examples from popular brands. They’re often shared and have become popular and inspirational and are a product of themselves. If you’re anything like me, a few popular ones that immediately come to mind are from larger companies. These examples from IBM, Microsoft, or General Electric are certainly noteworthy (if you’re just getting started, use these popular examples of Design Systems as inspiration). Most designers agree these systems are fantastic and it’s good design practice to have one. However, what happens if you work for a smaller company and don’t have an entire team dedicated to design standards? Are Design Systems still relevant and necessary? If so, are they something that should be prioritized? Size isn’t an issue. Small companies can create an awesome Design System just as well as a large company. Design Systems are relevant and necessary and should be a priority. Although small companies have a unique set of challenges compared to some larger organizations, small companies should embrace Design Systems and they will also reap the benefit. Who doesn’t love a good challenge? If you work at a small company, you are probably well aware of the challenges that come along with it. Often there are smaller teams, and sometimes roles overlap (one day you may be wireframing and then next day you might be declaring SASS variables). It’s not always easy to take on large design initiatives like a Design System if you work on a small team where resources may be more scarce. However, even with challenges, Design Systems are a worthwhile investment and where there is will, there is a way. Bottom line, improved usability is the end goal, which is the whole point for creating the Design System in the first place. This makes no difference if you’re at a large or small organization. To achieve this, you’ll need a centralized Design Systems as a point of reference. Design consistency is key to a unified brand that provides users with a consistent experience that is predictable and easy to understand throughout the application. Here are five important reasons why small companies should create, share, and prioritize their design system. “Force” may be a strong word, but a UI audit is important and a necessary process when planning for a new Design System or updating an existing one. Gauging from just the sound of it, a “UI audit” may not seem very exciting. If it does sound exciting to you, that is the perfect spot to be in since it’s arguably the most important step you’ll take in building a good system. To move forward, you must take a look at the past. In other words, the audit will help your team make sense of what you’ve been working with up to this point. To do this, take a look at all solutions and uncover issues that you find. It’s nothing to be afraid of, it’s a normal part of the process. Be sure to document your inconsistency findings, as you’re going through solutions one-by-one. I’ve gone through the audit process many times. A few examples that come to mind are conflicting color values, CSS style, and component inconsistencies. Even when teams work together, it’s hard to monitor everything. It’s not uncommon to find similar shades of a color, which are close, but slightly different that you don’t know which one was the original. Buttons might be slightly from one place to another, date pickers may be using a variety of different solutions, or there might be duplicate CSS styles. Along the way, there were many duplicated efforts when implementing a solution, so it’s no surprise that there are multiple versions of the same thing. Creating a detailed inventory and a “single source of truth” will help you establish a baseline. It’s not unusual to find similar colors used. Which one is correct? Commitment to this audit leads to important product conversations since you have to agree on what the correct UI elements are and what will be included in the Design System. During these conversations, it’s important to discuss what already exists in the UI, as well as, any missing pieces that need to be created. During this process you’ll have a better idea of what stays, goes, or still needs to be addressed. Designing a system where all use cases are documented, is a great way to have a fresh new start, where everything is streamlined. The purpose of the audit is to get rid of the one-off situations so the correct information is added to the Design System. Repetitive, standardized components that are used consistently, create a predictable and easy to use application. There’s a lot of buzz words in that sentence, but the moral of the story is that Design Systems allow designers and developers to remain focused on creating new product experiences rather than reinventing the wheel. This allows designers and developers to look ahead and prioritize consistency and put their focus on solving new problems. More focused teams are key to more efficient product design. Trying to do more in less time seems to be the name of the game, especially on small teams. Although it is a time investment upfront, this Design System will save time in the long run. With team members all working from the same central location, they can be sure that UI elements are correct and are added according to best practices. 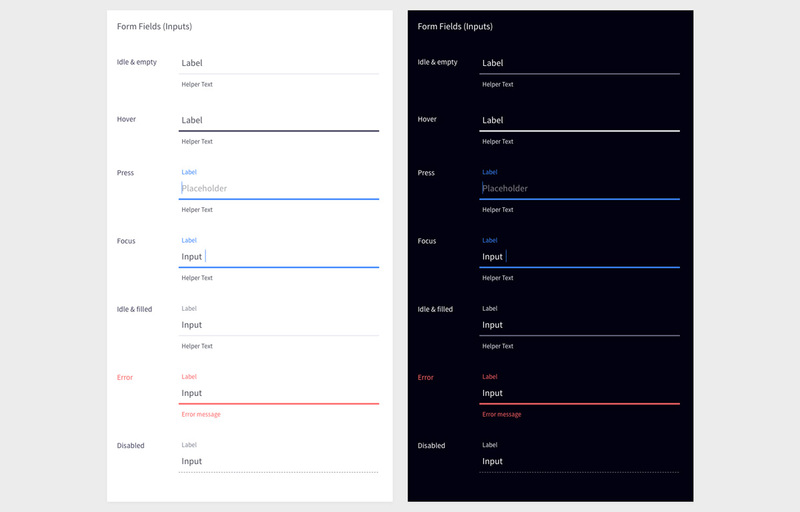 Instead of designing a form component for the fifth time, it’s already been done and can be referenced in the Design System. Product teams can instead put their time and energy into creating new experiences for their users. The pieces are in place, making it easy to find all of the components needed for prototypes. When working from an existing system, you can piece together what is needed to build interactions quickly. For those new to Design Systems, they may think that the design of the product becomes stagnant. Although it is a very valid concern, it’s hard to find data that supports it. In fact, the consensus seems to be the opposite: using set design patterns, the design possibilities for prototyping are endless and allow for more efficient experimentation. Design components are documented in the system, which is helpful for designers as they design the UI and for the developers that build the product. If you’re updating the UI design or are making changes to a user flow, updates are easy to visualize since all components are in one place. It’s a good way to gauge the impact of changes. This makes iterations quick and painless, and experimentation much faster. When working in a small company there’s a good chance that you wear many hats on a day-to-day basis. One day you might be doing UX research, the next you might be rearchitecting the product’s navigation. Prototyping may not be solely the designer’s responsibility, it may be something a team member with a different title occasionally helps with. If this is the case, the designer can feel confident that the design standards are being followed since the UI elements are documented in the Design System. With standardized design, cross-functional teams feel confident that they play a part in design and planning. Design Systems allow teams to build an endless amount of prototypes and variations for user testing, helping your team gain user insights and important data. Small teams often enlist the help of freelancers, so having empathy for their experience is key. Starting on a project as the new person can feel bit overwhelming, especially at first. It’s especially challenging if there are multiple places to track down design assets. Before Design Systems, it was not uncommon to encounter a workflow like this: one design document was found on Dropbox, there was a hidden working prototype somewhere that developers were using as a reference for styles, or there was a style guide PDF somewhere on the company SharePoint site. The issue with this is the time it takes to find it, the uncertainty of which one is right, and the new person just trying to get started. What do they do if they conflicting designs? How is a person just getting started with the brand supposed to determine the correct components to use? That’s why Design Systems are great for onboarding new team members. They can easily become acclimated to the brand and find all design assets in one place. The onboarding process is key to project happiness. Helping the freelancer learn the brand is important as they start on projects. Having a Design System will help them to get up to speed and ready to work with the team. They will appreciate having this central spot to reference the design information they throughout the project. In many cases, small companies are in the process of scaling and investing in design to continuously improve the product. Part of the scaling process is growing a design team. As the team grows, members may be in multiple locations which can add some complexity. A Design System helps increase collaboration, wherever team members reside. I can speak from my personal experience working in a distributed team. Without having a Design System as a central reference point, there are bound to be some design inconsistencies. Smaller companies may acquire other companies and with those acquisitions come design assets. It’s important to work together as a team and make a Design System. With this, everyone has access to the most up-to-date design information and there is no excess time spent on revisiting design decisions for the same component. Hopefully, these five reasons provide some insight into Design Systems and why they will help small companies. Remember, it’s not the size of the company that matters, it’s how you design the system.